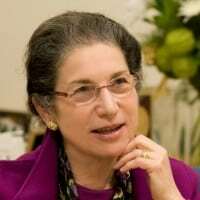 Dr. Patricia A. Ganz is a medical oncologist, and a member of the faculty of the UCLA School of Medicine since 1978 and the UCLA School of Public Health since 1992. Since 1993 she has been the Director of Cancer Prevention and Control Research at the Jonsson Comprehensive Cancer Center. In 1999 she was awarded an American Cancer Society Clinical Research Professorship for “Enhancing Patient Outcomes across the Cancer Control Continuum,” and in 1999 and 2000 received the Susan G. Komen Foundation Professor of Survivorship Award. Dr. Ganz was elected to the Institute of Medicine, U.S. National Academy of Sciences, in 2007. She served on the National Cancer Institute Board of Scientific Advisors from 2002-2007 and on the American Society of Clinical Oncology (ASCO) Board of Directors from 2003-2006. Dr. Ganz is a pioneer in the assessment of quality of life in cancer patients and survivors, and is active in clinical trials research with the National Surgical Adjuvant Breast and Bowel Project (NSABP). She has focused much of her clinical and research efforts in the areas of breast cancer and its prevention, and was a member of the NCI Progress Review Group on Breast Cancer. At the Jonsson Comprehensive Cancer Center, she leads the scientific program focused on Patients and Survivors. In 1997 she established the UCLA Family Cancer Registry and Genetic Evaluation Program, which serves patients and survivors, as well as those at high risk for familial/hereditary cancers. Her other major areas of research include cancer survivorship and late effects of cancer treatment, cancer in the elderly, and quality of care for cancer patients. She served on the Institute of Medicine (IOM) Committee responsible for the 2005 report “From Cancer Patient to Survivor: Lost in Transition,” and on the 2008 IOM Committee for the report “Cancer Care for the Whole Patient: Meeting Psychosocial Health Needs.” Dr. Ganz is an Associate Editor for the Journal of the National Cancer Institute, and CA-A Journal for Clinician, and is on the Editorial Board of the Journal of Cancer Survivorship. She was a founding member of the National Coalition for Cancer Survivorship (NCCS) in 1986, and has directed the UCLA-LIVESTRONG Survivorship Center of Excellence at the Jonsson Comprehensive Cancer Center since 2006.